Preface. A History of the Blockade of Germany and of the countries associated with her in the Great War: Austria-Hungary, Bulgaria and Turkey. By A. C. Bell. "The Blockade of Germany lasted from 1914-1919 and was a prolonged naval operation by the Allied Powers during and after World War 1 in an effort to restrict the maritime supply of raw materials and foodstuffs to the Central Powers. It is considered one of the key elements in the eventual allied victory in the war." [Wikipedia] Various sources put the blockade's death toll at anywhere from 350,000 to over a million, yet few make any mention of the fact that most of these deaths were among the civilian population, not among the fighting forces which would have been the Allies' only legitimate targets for military operations. Further, the blockade was continued fully eight months after an armistice ended hostilities. Thus, we regard the Allied Blockade of the Central Powers as one of modern history's little-known great crimes against humanity - yet the author describes the effects of this repulsive violation of international law and custom as "a great achievement"! as though this were an insignificant bit of trivia. Yet, since "the fighting efficiency of the German army was never reduced" - in other words, since the blockade had failed in its only legitimate mission - this death toll among women and children is in fact one of the foremost results and must be kept ever in mind by anyone reading the following pages. We wish to add here only two illustrations to bring this consequence to the fore. 1) The photo at the right is from an early 1920s magazine and shows starving German children from one of the more impoverished regions of Saxony or Thuringia. Months or even years after the war had ended, this was still the "great achievement" of Britain's "naval operation"! 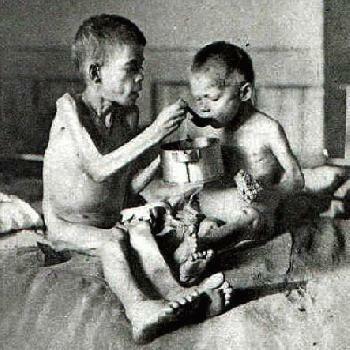 2) Our page graphics are based on a 1924 drawing by Käthe Kollwitz titled "Germany's Children are Starving". Both the drawing and the date of its creation speak for themselves. If Germany had committed these crimes against another nation, the world would still be talking about it with justified outrage to this day. But since the perpetrator was a more politically correct empire, let's blame the victim instead: read on! 19. July 2013, almost 100 years after the events described in this book. It was originally hoped that a history of the blockade during the great war might be included in the official history entitled Naval Operations, but this was found impracticable. It seemed to the Foreign Office and to those who will be responsible for the future education of British naval officers that it was really important that a history of the blockade should be compiled, and it was accordingly proposed to the committee controlling the official histories of the great war that this work should be undertaken; the committee accepted the suggestion, and Mr. A. C. Bell, of the Historical Section, Committee of Imperial Defence, was entrusted with its compilation. The Library of the Foreign Office, which is responsible for all historical work that is undertaken by that department, and the Historical Section of the Committee of Imperial Defence, which is responsible for producing all the official histories of the war, became conjointly responsible for putting together, and making available, the material upon which this particular history was founded, and for exercising some general supervision over its production; as this conjoint responsibility has throughout been a cordial co-operation, it has never been necessary to settle what share of responsibility was borne by the Library or the Historical Section. It soon became apparent that the work would not be suitable for publication, but (like the official History of Military Operations in Persia) should be printed and kept solely for official uses. The history is principally based on official material contained in the archives of the departments concerned with the direction of the blockade - first and foremost the Foreign Office, and then, though in a noticeably less degree, the Admiralty. It was not practicable to consult the archives of the Board of Trade owing to the time limits imposed on the historian, who was obliged to content himself with the Board of Trade letters which appear in the Foreign Office files. The typescript was submitted to the Admiralty, who made a number of valuable suggestions; the Board of Trade also received a copy of the typescript, but they declined to take any responsibility for the history. In as much, however, as the general direction of the various operations (apart of course from the naval side), which are described as the blockade, was centred in the Foreign Office, where the Minister of Blockade, when appointed, was established, it is only natural that the bulk of the material on which the narrative is based is to be found in the archives of that office, which include those of the special departments created for the purpose of dealing with particular aspects of the blockade, such as the Contraband Committee, the War Trade Statistical Department, the Restriction of Enemy Supplies Department, the War Trade Intelligence Department and the Foreign Trade Department. It may therefore be desirable to state that, while the present work is an official history written from official archives, in this case mainly from those of the Foreign Office, it has never been the practice of that department to allow current policy to influence any historical research which has been undertaken at Foreign Office instance. At the same time, the official historian is under an obligation, in view of the nature of the material which he has been authorised to use, to consult with the officials of the department and to ascertain their opinions on the operations which he describes; and in the present case it was naturally desirable that as much assistance as possible should be obtained from officers who had actually taken part in the conduct of the blockade. The long list of Foreign Office officials, retired and active, who have assisted the historian shows that this has been done with regard to the present work. [iv] Acknowledgments and thanks are accordingly due to many who have assisted the official historian by supplying material and by reading parts of his work and contributing valuable criticisms, especially to Lord Howard of Penrith, G.C.B., Sir Esmond Ovey, K.C.M.G., Sir Robert Craigie, K.C.M.G., Mr. Alwyn Parker, C.B., Mr. Gerald Spicer, C.B., Mr. O. O'Malley, C.M.G., and Mr. C. L. Paus, C.B.E. The work has also been scrutinised throughout by Sir William Malkin, G.C.M.G., Legal Adviser to the Foreign Office, and Sir Stephen Gaselee, K.C.M.G., the Librarian and Keeper of the Papers at the Foreign Office. It is also desired to acknowledge, with thanks, the help of Mr. C. V. Owen of the Historical Section of the Committee of Imperial Defence, who compiled the statistical tables, and as Colonel E. Y. Daniel, C.B.E., the Secretary to the Historical Section considers the help that he has given to official historians for twenty years past to be a mere matter of duty which calls for no remark, this places everyone who benefits from his assistance under a very particular obligation to acknowledge it duly. The historian has found it necessary on certain occasions to express his own views: these represent his personal opinion and are not necessarily endorsed by the Foreign Office or any other Department of His Majesty's Government. Finally, the word blockade in the title of the book should be regarded as if it were placed in inverted commas: for the expression, though conveniently employed as a general description of the measures taken by this country to deal with enemy commerce during the great war, is technically inaccurate, as a legal blockade of the central powers, in the technical sense given to the word in international law, was never declared, and the powers taken by Order in Council to deal with the trade of the central powers generally, and Germany in particular, were justified as reprisals for their infractions of international law. (For Maritime Orders in Council, see Appendix I, pp. 711-19. United States of America: protest upon the sinking of the Lusitania, Falaba and Gulflight.
" 17 Great Britain explains British measures and special concessions to America as regards cotton, etc. 1 Cental = 45.36 kilos = 99¼ lbs. cental, or quintal = 100 kilos = 220 lbs. China 1 Tael = 2 6 to 3s. 4d. Germany 1 Mark = 0 11½ abt. Turkey 1 Piastre = 0 2¼ abt. Uruguay 1 Peso = 4 2 abt.